Discussion in 'Suggestions, Feedback & Support' started by Rohan, May 20, 2018. Make username colours visible on the online list. Robin-Senpai Is The Best, Moman and Behnam like this. Why? Just by reading their names I already have their colors in my head. I don't think most of people here would mind about it. But still it's nice that someone mentioned it. I'm active in like 6 forums right now and the only one without this is OPF. Though I don't care much about it. I didn't even notice this difference until now, lol. I could be wrong on this, but since this forum is built on a template there may be some restrictions that prevent adding the ranking colors to everywhere they appear, including the “members online” box. Only @Owl can confirm. 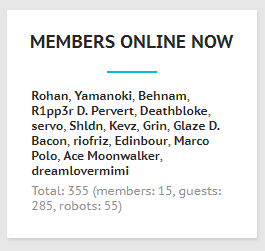 “ Members online box”, and at the right side of avatar's picture in that toolbox when it opens, also at bottom of the avatar, that's at the up right of the forum, below that “Open quick navigation” option. These 3 usernames are uncolored. EDIT: Also below the posts titles in newest threads and posts. It's not necessary, but I think I would like it! I don't think most of the forums even give colors to their members like this. But as I've seen, in online box, the staffs of the forum have colors and it's identified how much of staffs are online too. The other forum I am part of has that same feature. Irritates my eyes, tbh. And since I mainly care for those people I follow and their contents, I'll know who of them are online anyway, so I don't think I agree with this idea. I wanted to suggest the same thing! It makes distinguishing people much easier. This thread shows that it's an inbuilt option and easy to apply: https://xenforo.com/community/threads/user-group-colors-in-members-online-now.39570/ . To show your contributions to the forum by the coloured names.